A minke whale off the coast of Australia in the Pacific Ocean. In 1982, the International Whaling Commission (IWC) voted for a moratorium on commercial whaling. The vote was 25 for, 7 against with 5 abstentions. This landmark decision was a victory for conservationists, who had been pushing for a moratorium for a decade, but was seen as irrational by Japan and other pro-whaling nations like Norway and the Soviet Union. 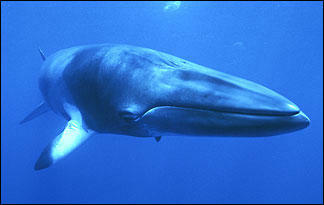 Japan continued its commercial harvest of minke and other whales. In 1984, for example, Japan harvested 3,908 whales — mostly minke, Bryde's and sperm — despite warnings from the United States and other nations which supported the IWC's moratorium. It became apparent that the IWC lacked the power to enforce its own decision. In response, the United States enacted the Pelly Amendment to the Fishermen's Protective Act of 1967, which restricts the "importation of fishery or wildlife products from countries which violate international fishery or endangered or threatened species programs." This amendment allows the President of the United States to "direct the Secretary of the Treasury to prohibit the bringing or the importation into the United States of any products from the offending country for any duration as the President determines appropriate." Shortly after the Pelly Amendment, Congress enacted the Packwood Amendment to the Magnuson Fishery Conservation and Management Act. This amendment demands that economic sanctions be imposed against any foreign country that conducts fishing operations in such a manner as to "diminish the effectiveness" of the International Convention for the Regulation of Whaling (ICRW). This includes decisions made by the IWC. After these amendments were passed in the mid-1980's, the Reagan Administration asked Japan to comply with the IWC moratorium on whaling or face trade sanctions and loss of fishing rights in U.S. waters. Japan stood to lose a million-ton Alaskan pollock fishery if it did not comply. After further negotiations, Japan finally agreed to withdraw its objection to the moratorium. Thus, the moratorium on commercial whaling went into effect in 1986. Later, the United States ended up phasing out the fish allocation, an unforeseen loss for Japan.